A lot of great material was ushered forth over the past week and the lion’s share of the great items to find promotion or premiere were songs. Destroyer swung for the fences and connected emphatically with the massive “Dream Lover“, Bad Bad Hats balanced sweet with spiky in “Shame“, Porcelain Raft conjured up another alluringly atmospheric dreamscape with “Half Awake“, and Adult Mom hit a career peak with the reactionary, synth-laden “Survival“. Institute take the feature spot for this batch of songs thanks to a sprawling behemoth of a track entitled “Cheerlessness”. Institute have been kicking away in Austin, TX for quite some time now and, thanks to their determined scrappiness, recently signed a deal with the vaunted Sacred Bones. They recently announced their first effort for the label, Catharsis, and provided a track along with the announcement. 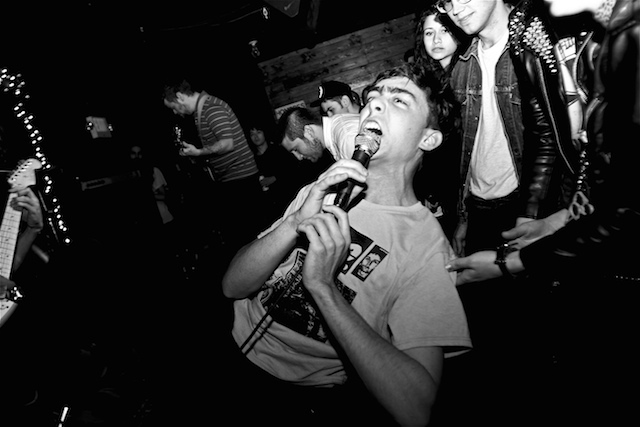 That song, “Cheerlessness”, is a relentless four-minute post-punk monster. Embracing all of the elements that make the genre so fascinating (tension, dynamic shifts, a bleak cynicism, sly subtlety, etc.) to create something that still manages to come across with a new, fully-formed identity is impressive. More impressive is the levels of conviction in display in “Cheerlessness”, from the instrumentation to the vocal delivery. Every punch the band throws hits its mark with enough brute force to leave a reverberating warning: we’re all in for one hell of a reckoning once Catharsis arrives. Listen to “Cheerlessness” below and pre-order Catharsis from Sacred Bones here.